Motivate your child to keep on learning! 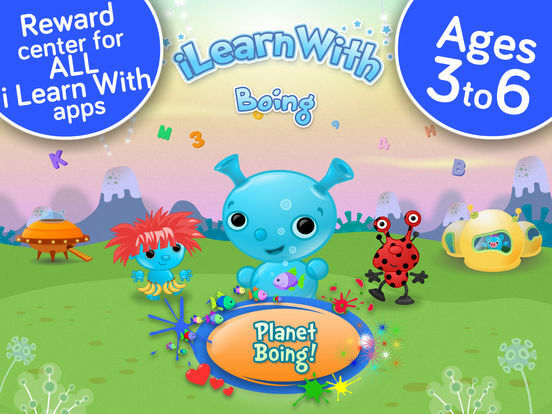 Planet Boing is a FREE game for kids in Preschool and Kindergarten and the rewards center for all the iLearn With kids educational games! Designed for iPhone, iPad and iPod touch, Planet Boing offers an incredibly engaging, free play environment filled with music, interactivity, and bright, colorful animations, that motivates your child to build essential skills in Math, Science, Literacy and more! HAVE FUN ON PLANET BOING! Your child can customize and dress up a wide variety of fun playful, bouncing aliens using fun accessories. Your child can then play with them by triggering a bunch of visual animations with fun effects and a unique music mix. Players can even use real backgrounds to play with – or even put themselves (or maybe their favorite pet!) in the scene! Players can also take pictures with the cute little aliens they've created. The planet grows richer as your child plays with the Boings and new decorations and characters appear. Motivate your child to build skills in Literacy, Math, Science and more. The planet is a rewards zone for kids with over 200 virtual items that Boing brought back from earth as souvenirs. Enough items are provided with the free download to make it fun and exciting, but the goal is to motivate kids to earn more items by completing game levels in the iLearn With educational apps. Copyright © 2015 BOING and I LEARN WITH are exclusive trademarks of TRIBAL NOVA INC. All rights reserved. Updated for the latest iOS and bug fixes.